There's nothing quite like a simple stir fry to stretch your protein. In this case, it's a half pound of fish tofu. Okay, fine. So fish tofu doesn't really have that much protein, but still. It's protein-ish? Meh, you can always just sub the fish tofu with any protein. Chicken or pork slices are always my go to (marinated with soy sauce, sugar, cornstarch and oil). It's what I grew up with...but I think fish slices would go nicely too. Just gotta brown them, take them out and then add them back in at the end so that it's not overcooked. Heat up a wok over high heat. If your cashews aren't roasted, toast them in the dry wok and then set aside in a clean bowl. Add oil and let it heat up until the oil shimmers. Add in ginger, garlic and white parts of the green onion. Cook until fragrant. Add protein and cook until lightly browned. Toss in onions, carrots, celery, salt, sugar and soy sauce. Mix well. Cover and cook until protein is cooked through and veggies are tender crisp. Stir in green parts of the green onion. Transfer everything onto a serving dish. 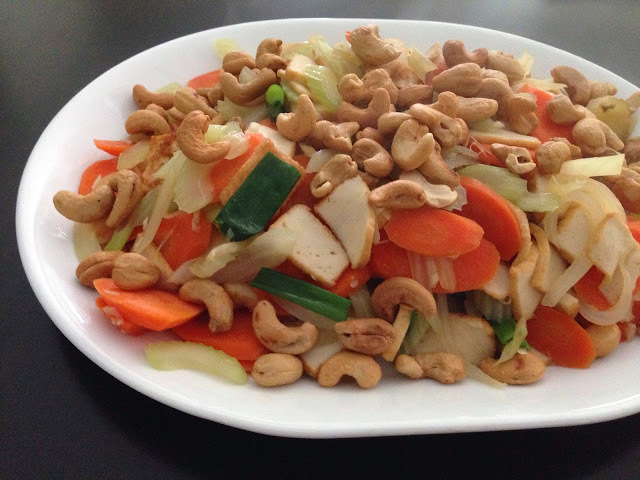 Top with toasted/roast cashews. Serve with rice and soup.